Mr. Whitaker’s predecessor overseeing the special counsel investigation, Rod J. Rosenstein, and his likely successor, William P. Barr, have both defended Mr. Mueller from the president’s accusation that the inquiry is a “witch hunt.” Mr. Whitaker was asked to do the same, and had a different answer. “Congressman, it would be inappropriate for me to talk about an ongoing investigation,” Mr. Whitaker said, but he added that he had not denied it any funds or interfered with Mr. Mueller’s work. He provided a similar answer to another Democrat. “There’s been no event, no decision that has required me to take any action, and I’ve not interfered in any way with the special counsel’s investigation,” he said. One moment in Mr. Whitaker’s testimony raised a potential conflict with news reports about events that led up to the Trump administration’s hiring of him. Pressed by Representative Zoe Lofgren, Democrat of California, to say whether he had spoken to Mr. Trump, his family, White House officials, or outside surrogates like Rudy Giuliani about his views of the Mueller investigation before he joined the Justice Department in the fall of 2017, Mr. Whitaker said definitively that he had not. “Congresswoman, just to be clear, you are asking me whether I talked with anybody in the president’s circle or the White House about my views of the special counsel investigation when I was a private citizen and not at the Department of Justice?” he said. “Correct, correct,” Ms. Lofgren replied. “No I did not,” he said. But, as The New York Times has reported, in July 2017 Mr. Whitaker interviewed with Donald F. McGahn II, then serving as Mr. Trump’s White House counsel, about the possibility of becoming the administration’s in-house lawyer who would manage and respond to the Mueller investigation. The White House instead ended up giving that job to Ty Cobb, and Mr. Whitaker continued to make public comments that were skeptical about the Russia investigation before the administration made him chief of staff to Mr. Sessions. A Justice Department spokeswoman had no immediate comment in response to an inquiry about how to square his testimony with the July 2017 interview with Mr. McGahn. Democrats used their questioning to repeatedly insinuate that Mr. Trump had chosen Mr. Whitaker as acting attorney general because of his openly critical views of the special counsel investigation. Mr. Whitaker repeatedly rejected that premise. 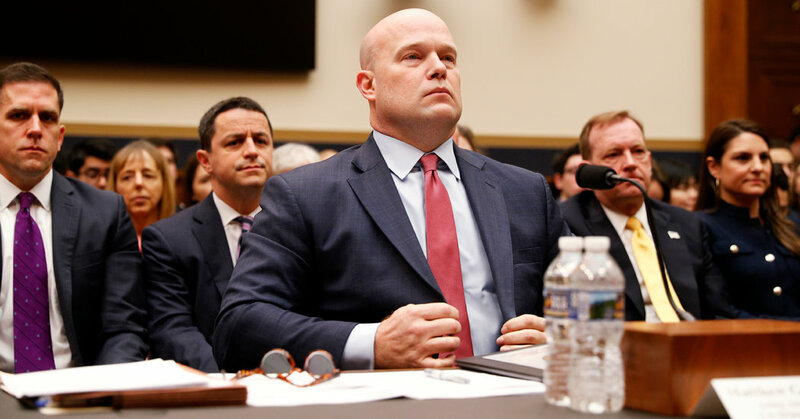 “I believe the president chose me to be acting attorney general for a couple of reasons,” Mr. Whitaker said. One was his experience as a United States attorney in Iowa. The other was his close work with Jeff Sessions, the former attorney general he served as his chief of staff. “I think the president was comfortable that to continue the momentum at the Department of Justice we had established in addressing these important priority issues like reducing violent crimes, combating the opioid crisis and others, that the president felt I was best positioned to do the duties of attorney general,” Mr. Whitaker said. Mr. Whitaker told Representative Zoe Lofgren, Democrat of California, that he would not discuss his decision to say last month that the Mueller inquiry was drawing to a close, citing the fact that it is an ongoing investigation. “It seems to me you did talk about an ongoing investigation,” Ms. Lofgren said, adding that she would like to know what he meant by his comments. Mr. Whitaker would say only that the special counsel investigation was proceeding consistent with the regulations outlined by Rod J. Rosenstein, the deputy attorney general. Representative Doug Collins of Georgia, the ranking Republican on the committee, criticized Democrats for obsessing over the special counsel investigation, but he had some questions of his own related to its work. The first related to the arrest of Roger J. Stone Jr., one of Mr. Trump’s longtime advisers, by the F.B.I. last month. CNN captured the raid of Mr. Stone’s Florida home live with a camera it had set up on the street, and Mr. Collins wanted to know if the news channel had been tipped off. Mr. Whitaker said the coincidence was “deeply concerning,” but said he did not know of any tip. “I share your concern with the possibility that a media outlet was tipped off to Mr. Stone’s either indictment or arrest before it was made,” Mr. Whitaker said. CNN has said its positioning was just a matter of good reporting and luck. Mr. Collins also asked whether or not Bruce Ohr, a once obscure Justice Department official, still worked there. Mr. Ohr has long been targeted by the president’s allies for contacts he and his wife, who worked as a contractor for Fusion GPS, had with that research firm, which helped compile a salacious dossier about Mr. Trump. The exchange was a remarkable breach of decorum between two branches of government. It is highly unusual for a witness, much less an official serving in an acting capacity, to challenge the chairman of a congressional committee that oversees his department. Whitaker repeatedly tried to shift to other subjects. As lawmakers pressed him again and again toward discussion of the special counsel’s investigation, Mr. Whitaker made clear that he would much prefer to talk about the department, its policies and its work. “I think it’s important as we sit here today that we understand that this is not a confirmation hearing, that I’m probably going to replaced by Bill Barr in the next week,” he said in one exchange, referring to William P. Barr, the president’s attorney general nominee. Mr. Collins, the ranking Republican on the committee, angrily attacked Democrats in his opening statement, saying that they were interested in carrying out a “character assassination” of Mr. Whitaker and damaging Mr. Trump, not carrying out oversight of the Department of Justice. Mr. Collins noted that Mr. Nadler had promised not to issue a subpoena to Mr. Whitaker on Friday, saying Democrats had played a “hide and seek game” in securing permission on Thursday to subpoena Mr. Whitaker. And, noting that Mr. Barr would probably be attorney general by the end of next week, he said Democrats were just interested in having a “show” for partisan purposes. Democrats’ antagonizing of Mr. Whitaker began before he was even in the hearing room on Friday. Four Democratic committee chairmen, including Mr. Nadler of the Judiciary Committee, released a letter they sent Mr. Whitaker on Thursday raising new questions about his work for a Florida company, World Patent Marketing, which is accused of defrauding customers. Mr. Whitaker, they said, had ignored their earlier requests for information. And new information obtained by the House indicated that Mr. Whitaker had not returned funds he had been paid by the company, which the chairmen said it had requested be returned to pay victims of the fraud. Mr. Whitaker tried to set the tone for the back and forth with lawmakers by saying in his opening statement that he would not answer questions about his conversations with Mr. Trump. “I will continue the longstanding Executive Branch policy and practice of not disclosing information that may be subject to executive privilege,” he said. That answer did not satisfy the chairman, who said he expected Mr. Whitaker to consult the Justice Department and White House to return “in the coming weeks” for a transcribed deposition. “Any questions that are unanswered today or require consultation with the White House will be asked again at that proceeding, and I expect a clean answer or a proper assertion of privilege,” Mr. Nadler said.